One of my FAVORITE places to go to Disney World is New Fantasyland. It just brings me this truly magical feeling. I am going to give you some information about it, and why I love it so much. New Fantasyland began to open in 2012, the same year Snow White’s Scary Adventures closed. That ride either closed because it was too much of a scary adventure, or because Disney was already planning Seven Dwarfs Mine Train. Either way, I love it. 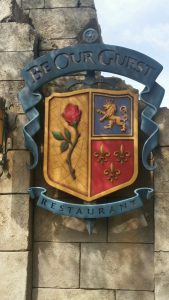 My favorite part of New Fantasyland is, the Beauty and the Beast themed part, where you can dine at Be Our Guest restaurant or go meet Gaston near his tavern and grab a snack there. My second favorite part of the new place has to be where you can meet Ariel at her grotto and then, go on Journey of the Little Mermaid. Another thing I love about this new place is the food and restaurants. One restaurant in New Fantasyland is, Be Our Guest restaurant. I LOVE the whole Beauty and the Beast idea, but there is one thing I do not like. The food. I’ve been there to eat twice, and both times I remember not liking the food very much. Other than the food, the restaurant is BEAUTIFUL, and I love the three rooms you can dine in. One time we ate in the ballroom, the second time we ate in the West Wing. I remember liking the West Wing better, because there were not as many people, and we sat pretty close to the rose! It even looked like it was snowing outside! (Even though it wasn’t because we were in sunny Florida.) Other than the food, I give the restaurant is pretty awesome! The last thing reason I LOVE the New Fantasyland is the feeling it gives you. It just gives you this “Disney” feeling with all of the castles, and magical characters like Fairy Godmother. I love this land more than the others because it features the dark rides. Dark rides are my FAVORITE. I even love Seven Dwarfs Mine Train, because it features animatronics. The whole Fantasyland feeling is just perfect. Those are some reasons why I love New Fantasyland.